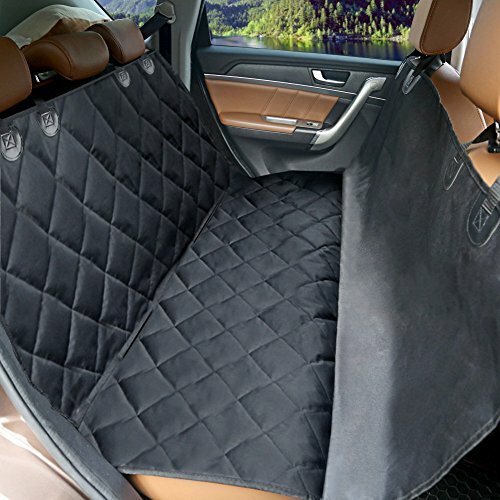 CLEAN CAR – dog seat covers barrier for cars helps keep your dog comfortable during a car ride and also prevents any scratches, claw marks, hair or other damage to your expensive back seat bench. Made of heavy duty 3 layers waterproof oxford material, middle is cotton comfortable for dogs pet, bottom is nonslip backing design to ensure long life. NON-SLIP DESIGN – Our pet seat cover has a non-slip surface to prevent your dog from slipping every time you apply the brake. Also built-in nonslip backing and seat anchors to prevent seat cover from sliding around. Built-in velcro openings for your Seat belts. NEW DESIGN – Car dog seat protector is design with 2 extra side flaps. Also side flaps can protect your car door from scratch, hair. Versatile split zipper around the side flaps hammock to allow pets and kids can share the back seat when zip up for a full hammock or zip down for half/half so dogs and passengers can travel together.